Purple martins nest in colonies. Over 1 million people put up martin houses, but many fail to attract any birds because of poor placement. Below you will find free purple martin bird house plans for building, installing and caring for these birds as well as how to increase your chances of attracting them. You can always add a second story to these plans or as many as you think you need depending how big the purple martin population is in your area. Photo of plans courtesy of Ohio Department of Natural Resources. Plans and information regarding placement, competitors and cleaning from Wisconsin Public Service. This is a pdf file. USDA Cooperative Extention design for 2-level, 16-room house. This is a pdf file. House sparrows and European starlings are purple martins greatest threat. In fact, some biologists have estimated that today's purple martin population is only 1/10 of what it was during the mid 1800s, before these species were introduced. Purple martin house plans have been now designed in a way to maximize nesting discouragement of house sparrows and starlings. 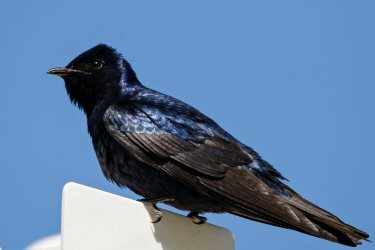 It is a comprehensive guide that will help ensure that once you build your own Purple Martin Bird House, you will be able to attract and care for them properly and maintain your Purple Martin colony for years to come. 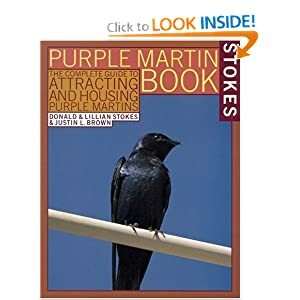 The Complete Guide To Attracting and Housing Purple Martins is very detailed with over 100 color photos. You can also add gourd birdhouses to your purple martin house by hanging them from the corners as additional houses. You can buy them already to go or learn how to grow gourds, how to dry gourds and make your own birdhouse gourd by following the link above. This is a great starter page for information about attracting and managing purple martins. Includes info on location, timing, competition, housing dimensions, competitors & predators. Photos of Purple Martin (top) and Purple Martin pair courtesy of Bill Thomson and Andrew C at flickr, respectively.